Having spent the last ten months challenging the people of Manchester we broke out on Saturday 7th March and headed on a road trip down the A580. 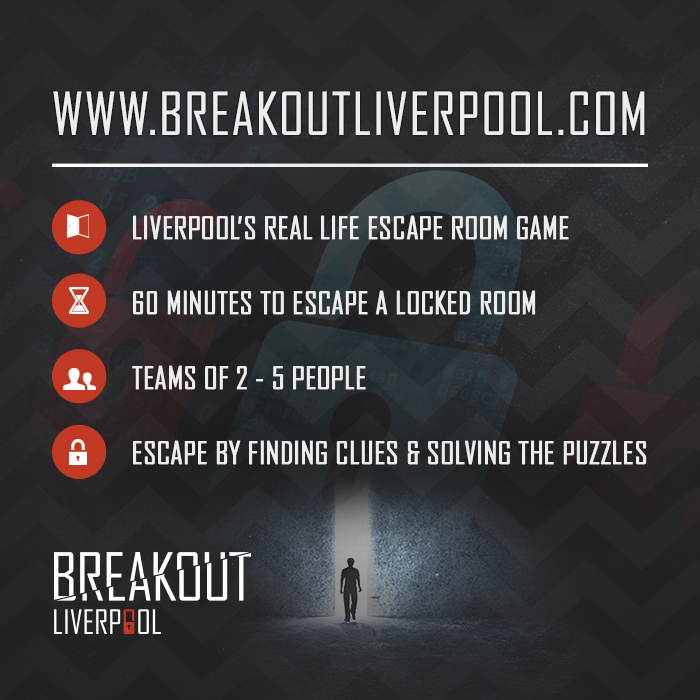 We ended up at Breakout Liverpool where we thought it would be fun to challenge you too! We are a live escape room game based on Sir Thomas Street where we allow members of the public to attempt to break out of our rooms. You have 60 minutes to solve a series of different puzzles and clues and attempt to escape, it’s a race against time and a test of your patience but yet thoroughly enjoyable and exciting. There are three different rooms at Breakout Liverpool, two taken from Breakout Manchester, Sabotage and Classified and our newest room which opened on Saturday 14th March, Shipwrecked. Sabotage sees you going deep behind enemy territory to stop a missile strike and you have 60 minutes before launch. The classified room see's players sitting their final entrance exam to become a secret agent. You must escape from the room to pass the exam. This is Breakout's most explosive and technologically advanced room yet! Think James Bond, Jack Bauer and Lara Croft. Shipwrecked see’s you climbing aboard the wreckage of Captain Chiver’s ship in hope of escaping with his most prized and valuable treasure before his ghost that endlessly haunts the ship finds you, and drags you down into his watery grave. Are you brave enough to come down and attempt to escape?